Some of Crosby's 50 plus Thai students with their postcards from Maine. Many of the coastal Maine students who participated drew lobsters for their pen pals- a specialty food item in Thailand that can cost up to $60 USD a piece. FARMINGTON - Students at Mt. Blue Middle School had the opportunity to make global connections recently, using snail mail to communicate with students in Thailand. The project was initiated by University of Maine at Farmington graduate and Fullbright Scholar Lauren Crosby who accepted a year-long teaching position in rural Thailand that began last fall. Crosby studied to be an English teacher while at UMF, gaining experience in the local school district before seeking positions elsewhere, including South Korea and rural Alaska. Crosby began piecing together "The Postcard Project" to bring more life to the English curriculum she was teaching in Thailand. "Most of my students dislike English because they are only taught grammar, spelling, and pronunciation in a rote learning routine. I wanted a way to show them that with English, you can open the doors to new friendships and cultures," Crosby said. With little supplies and even less funding, Crosby found a sponsor for the project- reaching back to her roots in Maine to get help from Mexicali Blues- a small store that sells international clothing, jewelry and other goods. The company covered all the supplies needed, along with shipping costs. "I think the most important lesson taught is that English can be used outside of school. English is tangible. The kids know this, but because of the school's location in rural Thailand, very few of them see or interact with foreigners," she said. "The Postcard Project gave them opportunities to connect with the "outside" world--which I feel is important for all young people regardless of their background." 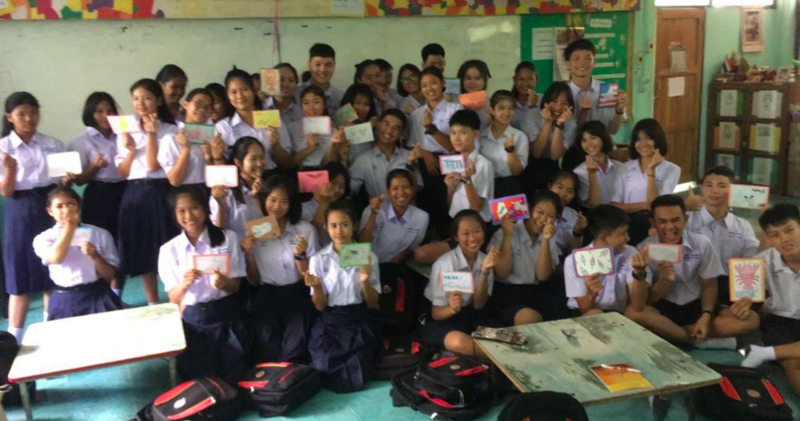 Using handmade postcards and their English skills, the students of Crosby's Thai classroom exchanged thoughts and pictures with students at Mt. Blue Middle School and other schools throughout Maine. Many of the kids are now connected on social media, and have continued communication since the end of the project. "Though there are major cultural differences, universally we are all the same. Everyone loves feeling like they have made or created something worth while, and who doesn't love getting a little something something in the mail?" Crosby said. To follow Crosby's oversees adventures click here, here or here.